i have gotten various questions over the last few months about which of my ingredients are organic, which are local, and how i choose everything. so i thought i'd write a bit about that and try to answer some questions. my priorities are local, then organic, and always delicious. this means that i'd rather choose something locally grown or made if it's delicious and naturally produced over something that is organic and grown or made in a land far, far away. and taste and quality of my ingredients are always so, so important. otherwise, our ice cream wouldn't be as good as it is! so when it comes to local ingredients, i've found a lot of great ones and am always open to suggestions if my customers know of a great farm or producers locally that i don't know of yet. my main ingredient, of course, is dairy. i get my milk and sugar pasteurized and homogenized together for me by the wonderful folks at Snoqualmie Ice Cream. Barry and Shanaz are an amazing couple who get all of their milk from a family owned dairy farm in Lynden, Washington where the cows are raised lovingly and humanely and are not treated with rbst or given antibiotics unless they're sick, but the farm is not registered organic. Barry runs an incredible operation in Maltby. he built an environmentally sustainable ice cream production plant out there where they recover all the heat from their machines to heat their water and do a lot of incredible things to make their business as green as it can be. they grow much of their own herbs and fruit for their own brand of ice cream in a small farm on the same property as their plant. that's where i get the dairy and most of the sugar for my ice creams. they pasteurize it and homogenize it for me and package with a tiny amount (less than one quarter of 1%) of tree gums and seaweed extract. it is important to me to support barry and i love his product. UPDATE (2009): Barry used to use corn syrup in the dairy base he makes for me, but after a couple good talks and a good reputation as a big customer for him, he has eliminated it for me. we are now 100% corn free! other local ingredients include berries (strawberries, raspberries, blueberries), which i get from a few different farmers in western Washington -- some are organic and some are not. my lavender is organic and comes from the lovely people at Lavender Haze in Sequim, WA. the hazelnuts we've been using in Baracky Road come from Holmquist Hazelnuts in Lynden. the walnuts i use are also grown in Washington. additional sugar (which i only use in the Salted Caramel, the sorbets, and in the toppings) comes from the sugar beet plant that i grew up near in Idaho. it's the closest place i've found to get sugar from, and while it's not organic (there is no organic sugar grown domestically), i feel good about buying local, keeping local jobs. sugar is a tough decision for me. organic sugar from paraguay is an option, but it would use tons more fossil fuels being shipped here and i wouldn't know anything about how the people involved in growing and making the sugar are treated and living. what do you think? my honey (used for Honey Lavender and a few sorbets) comes from Tahuya River Apiaries. the family who keeps bees for this little business is amazing. they've been working hard to keep their bees healthy through the bee crisis over the last decade in Western Washington. their bees live in the foothills of the Olympic mountains and i buy a 5 gallon bucket of their honey at the Ballard farmer's market every six weeks or so. their honey is the best i've ever tasted. ***UPDATE: we now use too much sugar to buy only from Tahuya River, and Roy from Tahuya isn't harvesting as much as he used to, so we currently also buy wild honey from Glory Bee in Eugene, Oregon. *** sorbets are also a great place to use local farmers' crops. we're just finishing up our run of peach sorbet and cantaloupe mint sorbet. the cantaloupe was grown in eastern Washington and the peaches and mint were grown in western Washington. if you haven't tried those flavors, come in and get them! they'll only be around for another week or two. then we're moving on to washington apples in a spiced cider sorbet and later a local cranberry sorbet. then there are flavors that need a little more than Western Washington can provide, like vanilla and chocolate. i get my organic vanilla extract and beans from Cook's in California (but the vanilla is not grown in the U.S.) and my chocolate is from a wonderful Seattle company, theo chocolate, which is the only fair trade bean-to-bar organic chocolate in the U.S.
as for other things in the shop, the organic sugar and cake cones are all from a company called Edward & Sons in California, and the waffle cone batter is from a local company, but we are working on our own recipe made with local flour. the organic sprinkles are from EAWeber as well. the salt i buy at Whole Foods. the bergamot infused olive oil is now from California as well. well, i hope that this post can answer a lot of people's questions about our ingredient choices. this is a constant work in progress and i'd love suggestions people have for getting more responsible ingredients. p.s. our shirts are from alternative apparel, mostly made from organic cotton and recycled polyester fibers -- they have a great social responsibility and environmental mission! and everything in our shop is compostable, if you didn't know already! You get your sugar from a dairy farm? How does /that/ work? thanks for the correction to my typo kerri! the sugar comes from snoqualmie gourmet homogenized with the dairy. the sugar doesn't come from a dairy farm. Why then does the distributor for Snoqualmie Gourmet's ice cream mix say that the milk, cream, and sugar are NOT organic? Also, in addition to the small amount of guar gum mentioned in your post, you neglect to list that Snoqualmie Gourmet's ice cream mix contains corn syrup, milk powder solids, locust gum and carrageenan. Please explain. i'm not sure where you're getting that list of ingredients, but if it's off the back of a pint, then it's not what goes into my ice cream. barry at snoqualmie gourmet makes a different recipe of mix for each flavor he makes, and each ice cream shop that he sells mix to. the milk all comes from an organic dairy, however. Thanks, molly, for responding. I got that list of ingredients from an official snoqualmie gourmet distributor for food service professionals (not from a pint of their ice cream). Barry runs a great and conscientious business. So, are you saying that for your particular mix all of the milk is organic? And what about the cream and sugar? In your particular mix are these both organic? 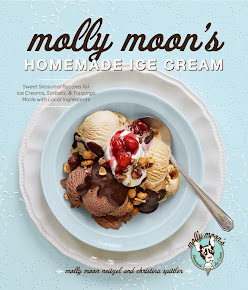 Does the Molly Moon mix contain corn syrup, milk powder solids, locust gum, or carrageenan? And do any of your flavors, for example the bubble gum, scout mint, or thai iced tea have any artificial colors or flavoring? As a patron and consumer, I like to know exactly what I'm purchasing and eating. Thanks! hi indra -- the sugars we use are not organic. they are as local as sugar can come -- beet sugar from idaho. the dairy in my mix from barry is organic. yes -- there are tree gums in my mix, but NO corn syrup in any of my products. i never use artificial colors or flavors. have you looked at the bubble gum & scout mint? it's white, so that's pretty easy to tell. the thai ice tea flavor we had this summer was tea colored, but only because of the actual tea. Keep up the good work because you guys rock! Hello Molly. First off, I'm a big fan of your ice cream and have visited twice from Canada in the past few months. After reading the discussion of ingredients used in your mix I am curious about what emulsifier you use. A dipper at one of the stores mentioned that the ice cream contains no eggs so what do you use instead? Mono and diglycerides?